A sad day for comedy. I grew up with the films of Mel Brooks, and I always loved Harvey Korman in every film. Even as a little kid, I got his comedy. He reached to all sorts of generations, and he’ll never be forgotten. I loved him the most as Count de Monet (“Don’t get saucy with me, Bernaise,” “Count da money”) in “History of the World Part 1” but he also had some of the most memorable Brooksian parts in “High Anxiety” as Dr. Charles Montague and in the classic western spoof “Blazing Saddles” as Hedley Lamarr (“That’s Hedley!” “But where would I find such a man?… Why am I asking you?”). Classics. He was also one of the stars of the classic “The Carol Burnett Show”- a show that invented comedy. Harvey Korman has left us at the age of 81. James Bond… Darth Vader… Indiana Jones… these are some of the best film characters of all time due to both their huge fan base and their undeniable longevity. The latter character has finally returned to the big screen with his fourth installment: “Indiana Jones and the Kingdom of the Crystal Skull.” But is Indy’s return worthy of celebration? Is it even necessary? Not exactly, but Spielberg, Lucas, and Ford have crafted an admirable bookend to a classic series that unquestionably has many flaws but doesn’t diminish their previous work with Henry Jones Jr., and definitely serves as a enjoyable trip to the theater and into our nostalgic love of that beloved, Fedora-wearing adventurer. It has been 19 years since we left Indy in his third film, “Indiana Jones and the Last Crusade.” Harrison Ford has certainly gotten a lot older, thus we have a much older Indy. The film opens with a very fun (albeit needless), 1950s-style car chase between a group of teenagers in a sports car against a convoy of army vehicles through the Nevada desert in 1957. The teenagers drive off into the distance as the convoy turns to go to a military facility. The facility is taken over by the convoy – a convoy of KGB army militants. The action of the sequence is excellently shot, and immerses us into Spielberg’s intriguing view of 1950s post-war nostalgia/communist fear. The Russians pulls up in front of a storage building, and we finally get to see our man Indy. He’s a changed Indy, both physically and mentally, although he still has his signature look and wit. He’s also got a new sidekick named Mac (Ray Winstone) who seems to be the plucky, comic relief. Indy isn’t too fond of his captors. He has a very pessimistic view towards Russians, as many did during the Cold War. We are introduced to the big bad villain Agent Irina Spalko (portrayed wonderfully by the best actress of our time, Cate Blanchett), a very passionately evil woman who does whatever it takes to get her way. Spalko brings Indy into the building and then forces him to find a crate that she is looking for. 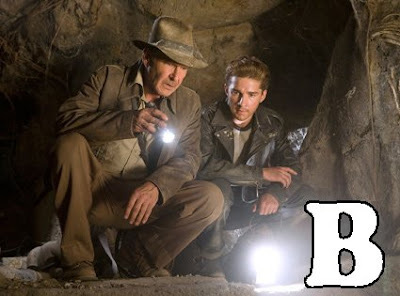 Spielberg keeps will the style of the Indy movies by introducing the action very quickly in the film, although we don’t find out what the exact artifact is, that Indy must retrieve, until a little later. As Indy makes his escape after finding that Mac has turned on him, we get to see Indy’s true feelings about the Russians when he utters a line that is up there with other famous Indy quotes such as “Why’d it have to be snakes?,” “Asps, very dangerous… you go first,” “No ticket,” and “Ah, Venice.” As Spalko offers him his last words, Indy exclaims proudly yet grimly, “I like Ike,” and then makes his excellent escape. The entire sequence in the building looks a little too fake and its studio location is a bit obvious, but it is a lot of fun and besides the next scene in the film it is really the most memorable part of the film. The next scene is brilliant. As Indy makes his escape he finds himself in a seemingly normal town. He tries to get into one of the houses and finds a family of mannequins watching an endless marathon of “Howdy Doody.” He runs outside and sees an entire town of stiffs, and then in the distance sees a nuclear bomb ready for testing. The scene is unlike any scene we’ve ever seen in an Indiana Jones film, and its awkward placement in the film is a sign of Spielberg’s growth as a director of movies like this. However, the fear on Harrison Ford’s face and the slow realization of his situation is a classic Indy moment and as he hides in the lead-lined refrigerator (a silly choice, but Indy is a superhuman character, so we just laugh along) we feel as though we’re finally back in the Jones universe. Indy’s artifact of choice in the film is the elusive crystal skull of ancient Peru. The skulls are not as famous as his former treasures (like the lost ark, or the cup of Christ) but it is their otherworldliness that makes them so alluring, especially to Spalko who wants to rule the minds of the world with it. Indy is never without his supporting characters, who unfortunately are a bit daunting in the film. Shia Labeouf stars as Mutt Williams, a stereotypical 1950s greaser who serves as Indy’s replacement sidekick. Mutt is a very welcome character in the series. Unlike Indy’s former juvenile sidekick, the irritating Short Round from “Indiana Jones and the Temple of Doom,” Mutt is the pathetic greaser that we love to watch. There is one particular scene that is especially memorable. As Indy and Mutt climb through a typical Jones-esque crypt, Mutt stumbles upon a hanging piece of dirt that hilariously startles him until he realizes what it is and states, “Oh, it’s just a… thing.” – Another classic Indy moment for the books. As mentioned earlier, some of the supporting characters are a bit daunting. At many times, there are just too many people on screen at once. There are too many characters to keep track of, which is especially frustrating when we find Indy doing very little during the elaborate chase sequences while all his friends do the work for him. It’s not fun to watch Indy drive as Mutt has a complex sword fight. Karen Allen makes her Indy return as Marion Ravenwood/Williams, and it’s sort of a sad return. When she is reintroduced, there are a few moments that really work with her character, but then through the rest of the film it just seemed as though screenwriter David Koepp through her all of the worst lines. She has a lot of useless moments, and it’s unfortunate because the talent appears to still be there, she’s just getting the bottom-of-the-barrel lines to read. Other characters, such as the inimitable John Hurt as the brain-dead Professor Oxley or the extremely talented Jim Broadbent as the unmemorable Dean Stanforth are just excessive and useless. Hurt doesn’t really have a lot to work with in the film, and he really doesn’t exercise his real good acting talent until the very end. Ray Winstone’s performance as Mac is also to be desired. He’s terribly clichéd, and his lust for wealth is somewhat pointless. Blanchett delivers another superb performance as the sickly evil villain. Her accent is perfect, as is the succinct ways that she carries her terrifying lines. She’s the best Indy villain in the entire series, without a doubt. Her character is a bit weak, and her inevitable death seems a bit unoriginal, but Blanchett does the best she can. Luckily for us, her best is the best. Like the three other films, Harrison Ford is still the best part about Indiana Jones. He still has the unmistakable wit, the godlike ability to survive anything and everything, and even after 19 years of aging he’s still as charming as ever. As Americans, Indy is still a hero to be proud of – a character we can look up to. The film isn’t perfect by any means. The script is unnaturally weak, and features a horrid ending that raises the “cheesy” level way too high over our comfort level. The films have always been a little cheesy, but they’ve never gone so over-the-top to become as annoying and hackneyed as Koepp’s ending. Also, the entire extra-terrestrial subplot is completely unnecessary. As for the visual effects, one could not tell that this was made in 2008. The effects are dated, but one can’t help but assume that that was Spielberg and Lucas’ intentions (Spielberg has said he wanted the original aesthetic). Speaking of Spielberg’s aesthetic, this film was actually quite challenging for the Oscar-winning master of the screen. For a director to reacquire an eye that hadn’t been used for the screen since 1989, and has developed a very specific style since then, Spielberg deserves a lot of recognition. The cinematography is exceptionally dated, and it completely fits with the rest of the series (the original films’ D.O.P., Douglas Slocombe, is now retired and Spielberg used Janusz Kaminski, his cinematographer since “Schindler’s List”). Overall, Indy’s return is a welcome one. His adventure is as enthralling as ever, the effects are intriguing, and one can’t help but get excited. It would have been a little more welcome had a film with such a low level of special effects had been made 15 or 16 years ago, but their choices are still admirable. “Indiana Jones and the Kingdom of the Crystal Skull” is a classic Hollywood-style adventure flick and deserves the gigantic audiences and the piles of cash it is accumulating, but one can’t help but wonder why Spielberg and Lucas decided to bring back their favorite raider. The film should be viewed in terms of sentimentality, which is probably what the filmmakers wanted. In terms of sentiments, the film exceptionally succeeds – and also happens to be a whole lot of fun. The long days of summer mean something different for many different people. Most get excited for the long days at the beach, sunbathing, travelling, or all of the above. For we, the intrepid moviegoers, summer represents a monstrous pile of Hollywood blockbusters. Usually those films are not exactly worthy of the millions of dollars they will inevitably accrue, but on occasion they are surprisingly good. The summer blockbuster bonanza kicked off last week with the release of the much anticipated, Jon Favreau directed “Iron Man.” Simply put, it can safely be said that the bar for films this summer has been set very high. Iron Man has never been the most popular comic character. Behind the shadow of Marvel Comic giants like The Hulk, Captain America, and Spider-man, Iron Man has always been seemingly forgotten by the American public. With his big screen debut, there is very little doubt that this REAL man of steel will finally get his close-up. In the original comic, Tony Stark is a millionaire reaping the benefits of the Vietnam War through Stark Industries, his weapons manufacturing company. Favreau, not intending to create a period piece, moved Stark’s captors to Afghanistan. While in the Middle East, a convoy carrying Stark is attacked and he is kidnapped by terrorists and ordered to create sophisticated weapons. Stark’s injuries are dire and shrapnel in his chest threatens to pierce his heart. With his fellow prisoner, Yin Sen (portrayed by Shaun Taub of 2004’s “Crash”), he constructs a powerful chest plate to keep the shrapnel from reaching his’s heart, keeping him alive. 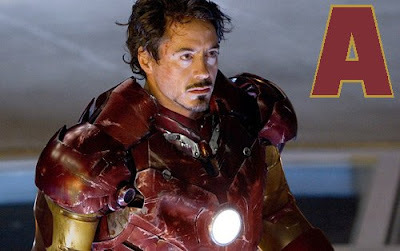 Stark uses the workshop to secretly design and construct a suit of powered armor. In this new suit he escapes, and returns home to start his journey into the hero he is destined to become: Iron Man. Robert Downey Jr. stars as Tony Stark/Iron Man in what is the best superhero casting since Christian Bale in 2005’s “Batman Begins.” This is Downey’s best accomplishment as an actor by far (even better than his wondrous Oscar nominated role as the title character in 1992’s “Chaplin”). When Downey is on screen, he shines. In fact, his performance is utterly addictive. He works an excellent balance between his amazing comedic talents with his range as a dramatic actor. It’s very refreshing to see such an underrated actor fit successfully into a role like Tony Stark – a role that could lead to bigger and better parts. The film truly belongs to Downey, but should also be credited for some exceptional special effects. Favreau made a smart investment in hiring George Lucas’ Industrial Light & Magic to create the visuals. The switches between the usage of these effects and the actual Iron Man suit are exceptionally cohesive and remarkably detailed. On the outside, “Iron Man” is seemingly your everyday action film but in fact it truly has a brain – and a heart. Featuring a screenwriting team of four credited writers, this film shows honest hard work in filmmaking. A lot of blockbusters are unnecessarily rushed (as was the problem with 2006’s “X-Men: The Last Stand”) and under-produced based on spectacle and mindless entertainment. This script is succinctly perfect, delivering a very consistent and respectful comic book story that can both excite fans and those not familiar with the comics. The film is actually quite structurally similar to the innovative “Batman Begins.” The first 45 minutes serves as an account of why and how Tony Stark finally becomes Iron Man, while the rest provides fast-paced action and never fails at being absolutely enthralling. Favreau deserves a lot of credit, and hopefully this film will achieve the commercial success that it should. He first gained fame in the mid-nineties after scripting hits like “Swingers” and its follow-up “Made.” In recent years he has become a go-to director with hits like “Elf” and the flawed yet interesting “Zathura.” With “Iron Man,” Favreau (who also appears in the film as Tony Stark’s bodyguard) could be a name that we may soon associate with excellent cinema such as we did with names like Spielberg and Lucas in the ‘70s. The recent slew of Marvel films such as the extraordinarily disappointing “Spider-man 3” and the horrid “Fantastic 4” travesties can be immediately forgiven after one viewing of this film. This is a wonderful start to what promises to be a summer of excellent Hollywood fare including Spielberg’s upcoming “Indiana Jones and the Kingdom of the Crystal Skull” and Christopher Nolan’s intriguing “Batman Begins” follow-up “The Dark Knight.” “Iron Man” is as solid as its title suggests with not one bit of rust to be found. Filed under Iron Man, Jon Favreau, Review, Robert Downey Jr.